Daimler Buses works closely with Mercedes-Benz vans in the development of the Dortmund converted Sprinter Travel 65. Several of the vehicles carried extensive on board technical monitoring equipment. With operators’ expectations of buses and coaches constantly increasing and the demands placed upon their performance by legislators ever more stringent, the task of ensuring that vehicles meet all of these requirements in all conditions is an extremely demanding one. It necessitates rigorous testing programmes covering every component and system in every type of conditions that buses will be expected to operate in. 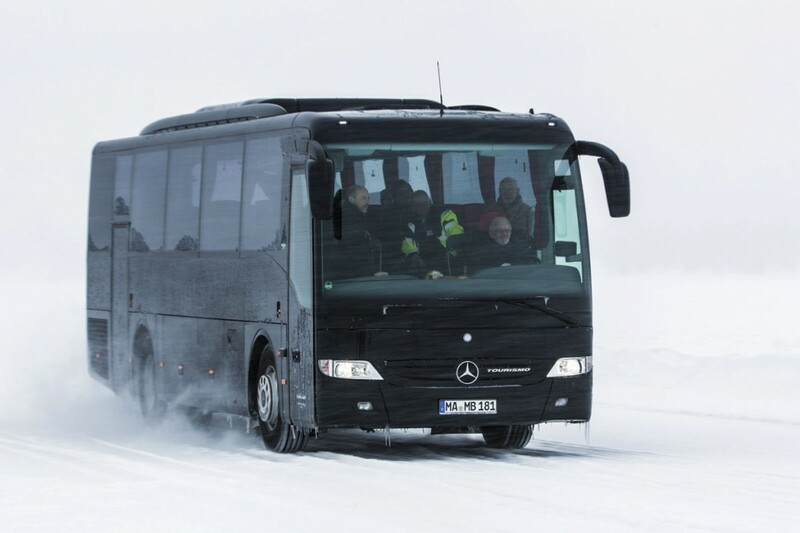 Daimler Buses recently provided an insight into part of its testing commitment by taking a party of journalists to Arvidsjaur, just south of the arctic circle in Swedish Lapland, to witness a demonstration of what happens during its winter testing programme on Lake Stentrasket. 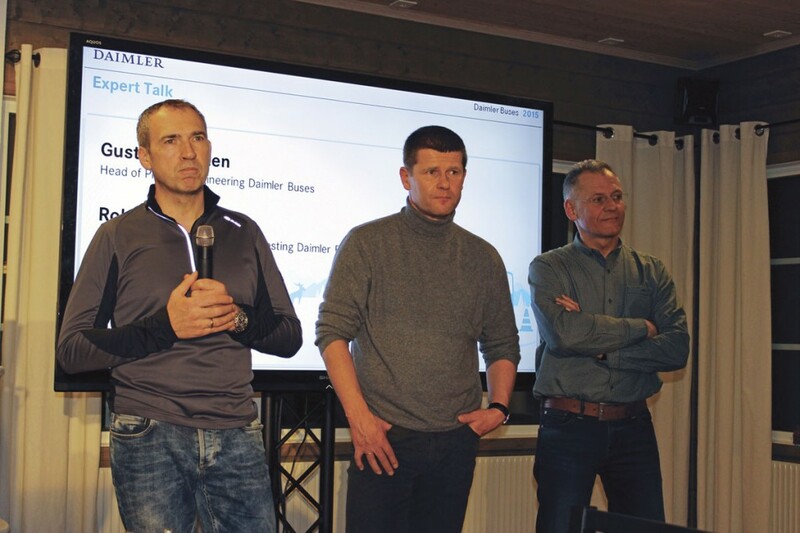 We were hosted by an extensive Daimler buses team headed by Head of Product Engineering, Gustav Tuschen; Head of Powertrain and Vehicle Testing, Robert Kappel (who until recently headed Coach development); and Head of Vehicle Testing, Andreas Dingler. 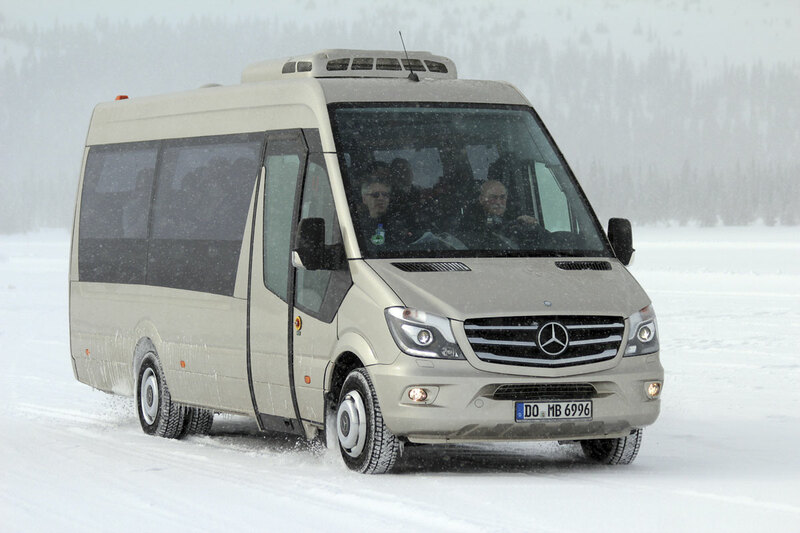 Winter testing has been a regular annual part of the company’s programme for the past 40 years but it is only part of the extensive regime that the Daimler team and its vehicles undertake. There is also a major summer testing schedule in the Sierra Nevada, Spain, where it is usually 40 degrees C during the day and the effects of extremes of heat can be evaluated. Ongoing durability testing programmes are undertaken at Erzurum in the east of Turkey, where the altitude is over 2,000m, there are major temperature changes during the day and the humidity is high. This is all backed up by ongoing physical and simulation testing in Germany. Daimler Buses has a vast range of different models including city, intercity and tourist ranges covering minibuses to extended articulated city buses and from minicoaches to 15m high deck coaches. With a choice of heights and lengths as well as different engines, transmissions and other key options, the range is immense and it would not be possible or economically viable to test every variant. Instead, Daimler engineers carefully select a range of representative vehicles that embody the key elements of its modular ranges and tests them exhaustively. Arvidsjaur is a mecca for automotive and commercial vehicle testing with many of the major manufacturers sending their teams there for periods during the winter months. As well as Arvidsjaur, Daimler also uses Arjeplog in Sweden and Rovaniemi, north of the Arctic Circle in Finland every year. At Rovaniemi, the extent of the facilities is rather more considerable, including a climbing hill, a driving course, a skidpan and, using facilities at the airport, the opportunity to test on a combination of polished ice and heated tarmac. Here, the bus testing team works alongside colleagues from the truck side of Daimler’s commercial vehicle operations as well as with leading component suppliers such as Wabco. Apart from the benefits of durability testing, the specific benefits of testing in extremely cold climates are firstly the obvious one that they permit understanding of performance in the cold and secondly the ability to enhance the handling and safety of vehicles in low friction circumstances. Undertaking the five to six week tests is arduous for the teams involved, requiring very long hours, six days a week, in very cold conditions, often in the dark. All of those participating are volunteers. Although simulation using computer systems is massively important in the development of modern vehicles, it cannot do everything and the effects of cold temperatures and low friction surfaces are notoriously difficult to simulate. Actual testing enables the discovery of problems that could never be found through simulation and is also vitally important in refining and informing future simulations. At all three winter testing locations, winter begins in October and lasts until May, with average daily temperatures below zero degrees Celsius throughout that period. 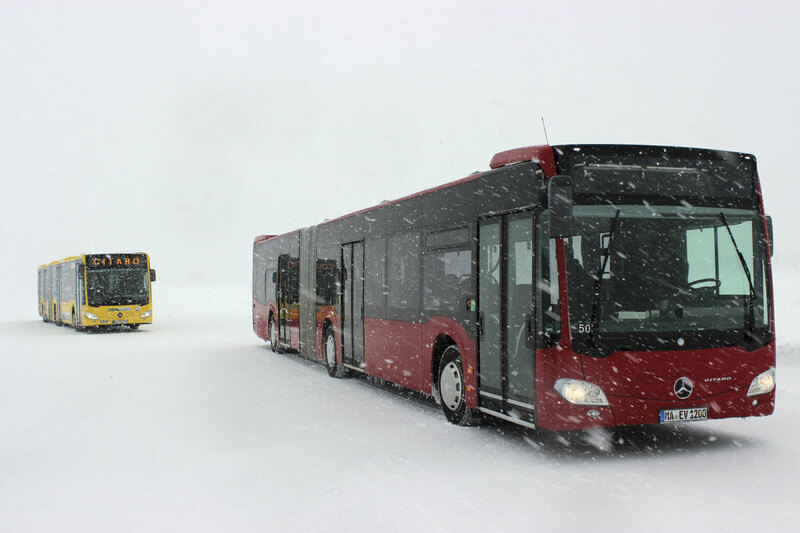 It is only necessary for the Daimler Buses team to be there for around six weeks, generally in February/March. Once the ice on the surface of local lakes has frozen to a depth of at between 10-20cm, the Icemakers get to work. Initially snow mobiles are used for the work but a switch to truck or tractor mounted snow ploughs and scourers is made once the ice is sufficiently thick. They clear the surface of snow, which would otherwise act as insulation, in order that the ice will freeze more easily to a greater depth. As the ice gets thicker they continue preparing it and maintaining it, producing both strips and circuits for different types of test. Away from the main prepared areas, the ice will not be as thick or as strong. The weight limit for vehicles on the ice is 40-tonnes. To safely carry the weight of buses laden with ballast and testing equipment a minimum ice depth of at least 80cm is required. At the time of our visit it was at the 120cm mark on the prepared tracks, which was reassuring because the depth of the lake is over 200m. Depending on what tests the teams want to carry out, they will ask the Icemakers to prepare a suitable finish. This might involve polishing the surface, slightly roughening it or using fine water mist to create a finish that we were told is nearly impassable. Robert Kappel told me that the lowest temperature he had experienced personally while testing was -36 degrees C, but that the lowest it had been on the week we were there was -19 degrees C. Having arrived in sunshine the evening before, our day on the ice in mid-March was spent at around the zero mark with near continuous snow, except for a brief spell at lunch time when the sun thought about coming out before deciding not to bother. We were told not be concerned if we heard a crack in the ice or saw a crack open up, because it does happen, but under no circumstances were we to put our fingers in the split because they close up again! When on the ice, vehicles keep some distance apart from each other to prevent placing to much pressure on the ice. Apparently, driving a heavy vehicle on the ice does create something of a bow wave under the surface and it is wise to try and prevent two such waves meeting. Gustav Tuschen explained that Daimler Buses’ vehicles aimed to be the ‘Best Buses’. The brand stood for safety, driving dynamics and functionality and that they looked to lead in technology, innovation, efficiency and quality. The production creation system started with the definition of the product and its specification and once this had been done there followed the intensive process of concept analysis, component design, prototype assembling and extensive testing activities before series production and vehicle delivery could begin. 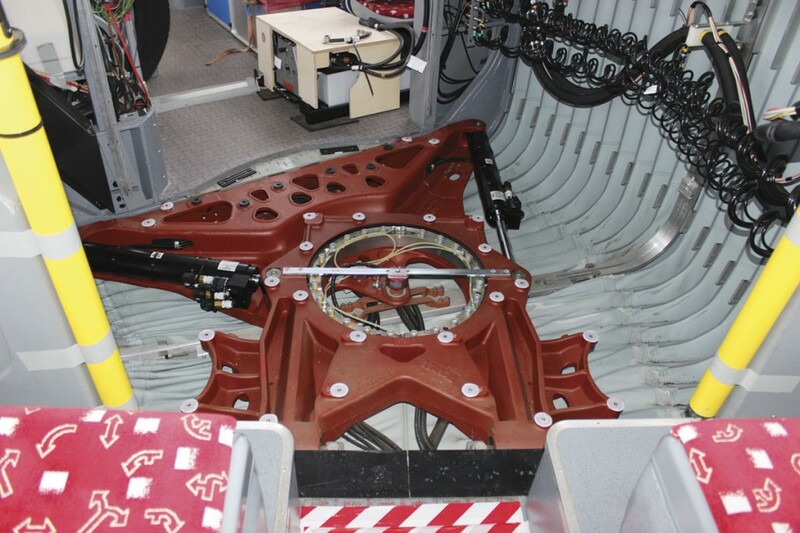 Within the testing process there was pre-testing, component testing and drivetrain testing to undertake before prototypes could be built and put through an evaluation regime. Development involved calculation and simulation to determine an optimised design prior to prototype building, married with physical testing of the resulting prototypes to demonstrate the efficacy of the simulations and identify where improvements could be made. Some of the key areas that Gustav Tuschen said required testing scrutiny to verify simulation data were: the performance of the exhaust gas aftertreatment system at low load and low temperature, air flow in the engine compartment and the function of the braking and ESP systems. With the introduction of completely new engines and driveline configurations for Euro6, a total of 60 prototypes had been produced of which 26 had been used for durability runs totalling over 5,000,000km. Forty two testing engineers, 33 mechanics and numerous drivers had been required to undertake this work. It was Daimler Buses’ own internal requirement that its vehicles should function fully and without compromise at temperatures as low as minus 25 degrees Celsius and that they should continue to function with minor restrictions down to minus 40 degrees C. Illustrating what was meant by a minor restrictions we were told that the central computer might take slightly longer than usual to start operating. 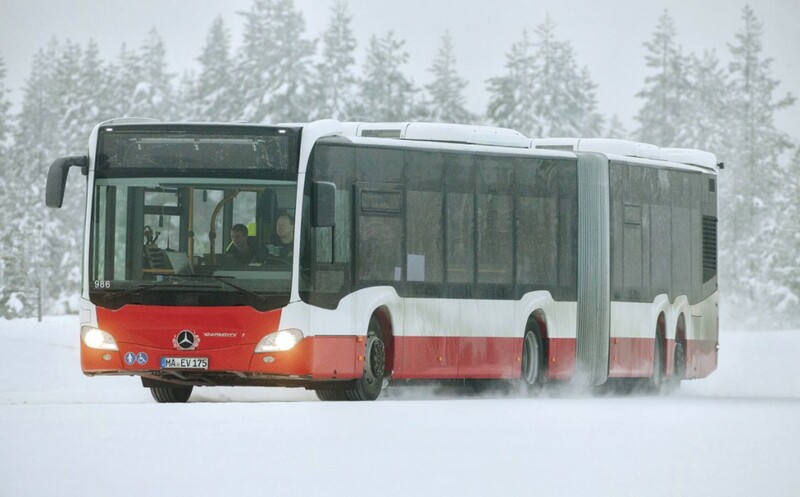 Daimler Buses would continue to exceed legal requirements regarding: braking and Electronic Braking Systems; assistance systems; steering; air pressure; and tilting stability. In defining the sequence of priorities for operability, preference was always given to safety and functional safety so that the first call would be the engine, the second would be the driver’s controls and the third would be the passenger areas. The fuel supplied locally is good down to minus 38 degrees C and a special arctic blend is available that gives a temperature range of an extra 5-6 degrees C down to 43/44 degrees C.
Winter testing is not just about low friction and keeping the bus going in the cold, it also gives the opportunity to check how different materials and combinations of materials perform? This is especially important in composites which may be constructed using materials that become flexible or brittle at low temperatures. 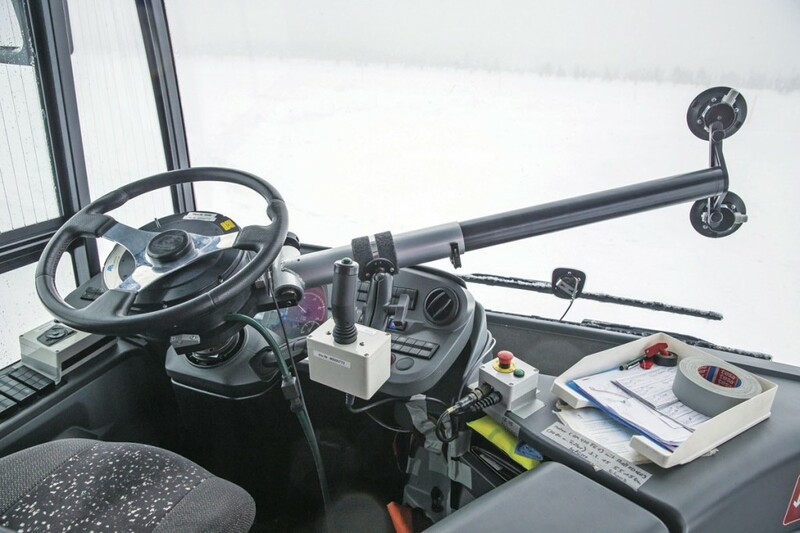 Other specific functions evaluated include: heating, ventilation and air conditioning; windscreen de-icing; windscreen wipers; the sealing and operation of doors and flaps at very low temperatures; how do adhesives behave; and how easy is it to fit snow chains and do they work? 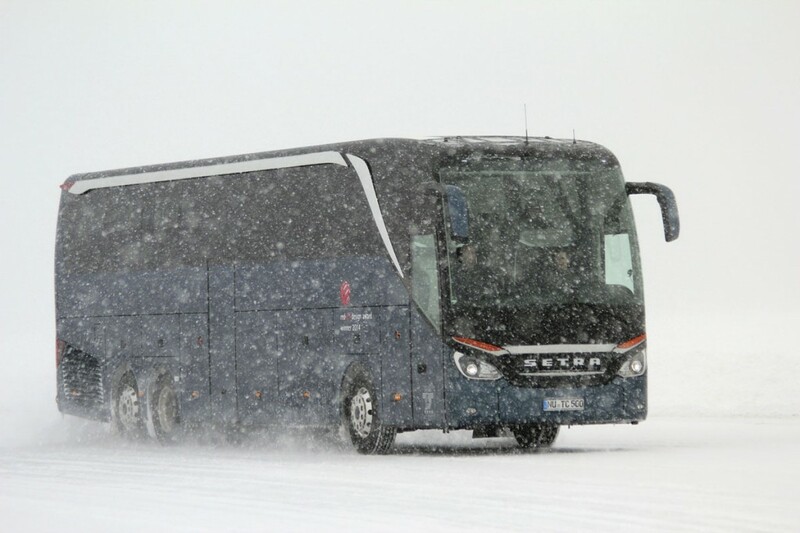 In four separate sessions on the ice as well as on roads in the vicinity we were shown how different models brake and perform on ice, including the 13.325m Setra TopClass S516HDH with 510bhp/375kW OM471 engine, the Mercedes-Benz Travego safety coach, the 10.32m low height Tourismo K, the Sprinter Travel 65 minicoach, a pair of Mercedes-Benz Citaro G articulated buses and a Citaro CapaCity L, extra long artic/BRT vehicle. Demonstrations included four exercises from the Daimler Professional Driving Programme, including: following a slalom course on which one side is highly polished and the other is has a rough surface; comparative braking at 30kmh and 60kmh; braking in a straight line on split friction surfaces; and finally stopping a coach in a distance too short for it to be done, so that the driver was required to brake and steer round an obstacle. One specific new development we were shown being tested was the new ATC articulated turntable controller, which has recently completed all of its winter tests. 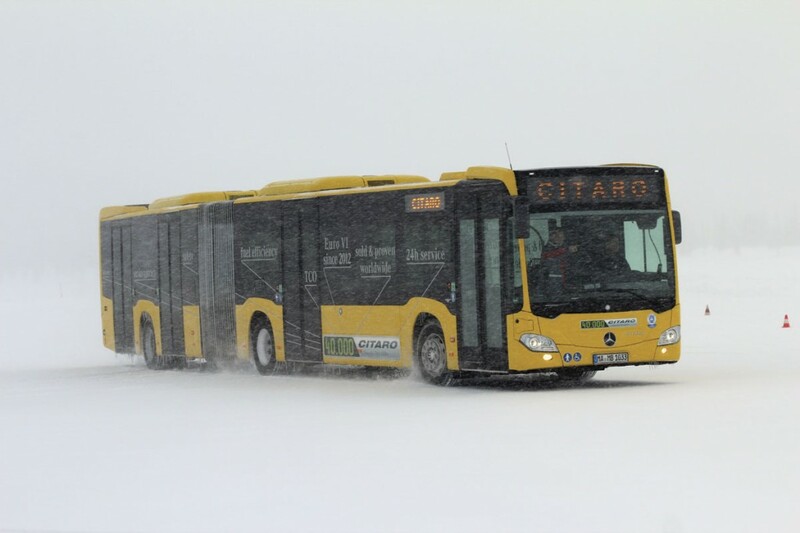 To this end, two 18.125m Citaro G articulated and one 20.995m Citaro CapaCity L were on the ice and journalists were invited to drive them through slalom courses and other braking and manoeuvring exercises to demonstrate their capabilities. The Capacity L has four axles including a steered rear axle and a passenger capacity as demonstrated of 47 seated and 135 standing passengers. As they showed in various manoeuvres, including the slalom, and high speed braking, the ATC is astonishingly effective. In order to get accurate testing figures it is important to replicate the conditions as exactly as possible between a manoeuvre carried out with the new software in place and with the old system. Replicating the conditions exactly wasn’t always easy because it relied on the driver to do things exactly the same, which isn’t always easy. Among a number of testing devices we were shown was a new robotic arm that overcomes this problem. Using it, the driver undertakes a manoeuvre having first pressed a button on the device. It then records exactly what he does and at the press of a button exactly the same action can be replicated, without the driver having to touch the wheel. It all makes for more accurate test results. The question and answer sessions that followed the presentations proved particularly illuminating. 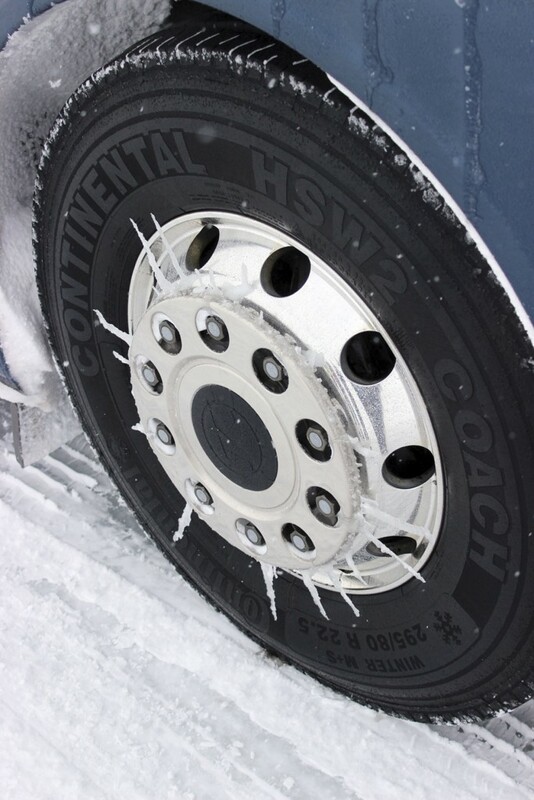 One questioner asked what difference tyres made on ice and was told that it didn’t make much difference providing they were at the correct pressure. Apparently tyre design doesn’t make much difference to performance at below 100kmh. The proof of all the testing is already showing in warranty costs. Gustav said that when you introduce a new engine family you expect quality costs to ramp up but in fact they have been normal, as in any other year showing the Euro6 range was already highly reliable. He described cost levels on Daimler’s Euro6 bus range as ‘extraordinarily low’. Asked about AdBlue, which freezes at -11degrees C, Gustav Tuschen said that this was why Daimler had heated AdBlue tanks. The legal limit for unfreezing an AdBlue tank was 45 minutes but Daimler expected its products to do better than that. He said it was important because without AdBlue you could not achieve Euro6. Winter testing will become no less important in the future if electric buses are to be more popular, because Gustav Tuschen pointed out that there are ‘linear correlations’ between low temperature and battery performance, adding, ‘at minus 30degrees centigrade you have to take a close look at the range possible.’ It was suggested that range could drop by as much as 40% in very cold conditions, though it was also pointed out that heating and cooling the bus could lead to reduced range. Maybe heating the batteries was a possible solution, as was cooling them, they said. Whilst on the ice, I asked Robert Kappel how much better the accuracy of simulations was these days and he estimated that they had improved the accuracy by about 200% in the past five years with regard to braking and dynamics. He also mentioned the input of colleagues in the car and truck divisions whose knowledge had helped. He pointed out that simulations needed special computers. The company had its own in Stuttgart but for really big calculations, such as simulating the whole of the passenger compartment for HVAC systems they needed to call in the help of the technical university at Stuttgart, where they had a dynamic simulator on which you could see the temperature and the speed of the air in each seat place as well as getting a feeling for the noise and the efficiency. We tend to take for granted the performance of our vehicles in cold conditions; providing we have ensured that our batteries are properly maintained and there is sufficient anti-freeze in the system, but this trip to Lapland highlighted the efforts the manufacturers make to ensure that when we press the start button everything works and continues to work whatever we encounter. It certainly seemed odd looking at the sat nav and seeing the needle indicating a position in the middle of a lake. Don’t try it in the summer though because Daimler haven’t yet developed AFC (automatic float control), though I wouldn’t be surprised if they don’t come up with it one day.